This is a huge instrument in every sense. Bubinga, with its rich but extremely balanced tonal response, is one of the best choices for a 12-string. The top is explosive per usual with a Boucher. Top it off with glorious looks and this flattop orchestra proves that every guitarist needs a 12-string! 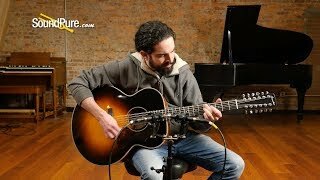 In this video, Sound Pure Guitar specialist Michael Buckley tests an extraordinary (and beautiful!) 12-string Boucher Studio Goose S-Jumbo. The STUDIO series is your chance to get a high-quality guitar with enhanced sound properties. Choose a guitar that suits your individual style from a diverse palette of noble and exotic woods. In addition, these guitars are all equipped with carefully-selected Adirondack spruce soundboards and bracing. Hand-crafted in the finest of traditions, their refined look and glossy finish make STUDIO series guitars instruments that stand out for their high quality.